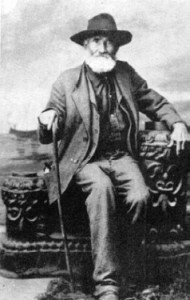 Dewitt County Deputy Sheriff William Sutton set off the longest-lasting and most widespread feud in Texas history when, in three separate 1866 incidents, he shot and killed three members of former Texas Ranger Creed Taylor’s family. In 1867, two more Taylors died while Sutton was attempting to arrest them on a minor charge. After adopting the motto “Who sheds a Taylor’s blood, by a Taylor’s hand must fall,” the Taylors retaliated by killing two Sutton allies. Mob violence, ambushes, prison breaks, and lynchings ensued. Sutton himself was gunned down while attempting to board a steamboat and high-tail it out of the area. Numerous attempts at peacemaking failed until Texas Ranger Captain Leander McNelly and his Special Force put a stop to the violence. Body count: at least 35. The image is Creed Taylor, ca. 1890. He lived a long life.